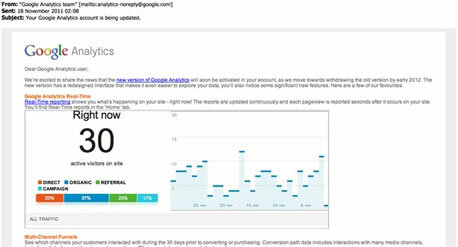 As a Google Analytics user, you will have recently received an email in your inbox from Google, informing you of some of the new features that are being launched as part of the new Google Analytics. Google is implementing a number of new features to the existing Google Analytics platform, some of which are already available within your account and others which will soon be launching. In an email sent to all Google Analytics users last week, Google informed users that they will be withdrawing the old version by early 2012. Multiple dashboards – build a custom dashboard for each department (read more). Event Goals! Track your PDF downloads as goals with events, or configure 2 minutes’ play time on a video as a goal. Read Kayden’s great blog post on this feature. More powerful custom reports – you can pre-filter reports and build additional data views (read more). While these new features are not currently available in the new version of Analytics, they will be coming very soon. Stay tuned for updates. Talk to Silver Rocket Digital today about making the most of your Google Analytics account and to truly understand visitors to your website.